The aim of the project is to bundle the efforts of control and applied mathematics laboratories (from both theoretical and experimental point of view) dealing with the structural properties and control of systems pertaining to different physical areas (acoustics, structural mechanics, mass and heat transport phenomena, chemical engineering systems, material science) for the development of methods and algorithms for the boundary control of nonlinear and dissipative open multiphysical systems using the formalism of dissipative Hamiltonian systems with boundary port variables. The first kernel topic of the project is to deal with coupled reversible and irreversible phenomena and deal for instance with or coupled convection and diffusive phenomena using the common geometric structure of Stokes-Dirac structures. 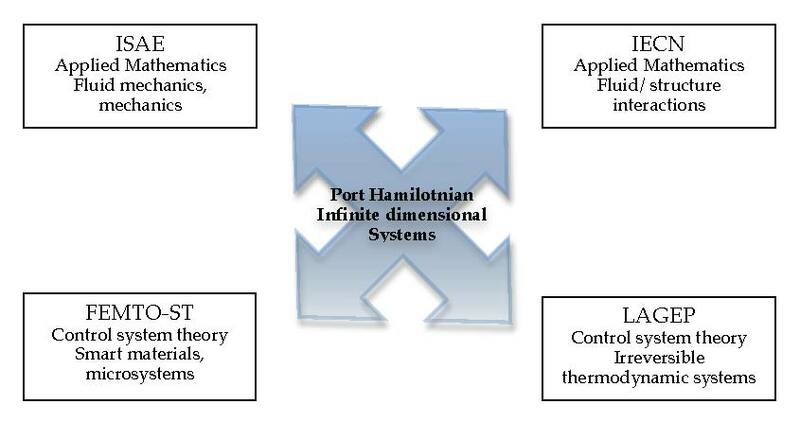 The second kernel topic is to deal with approximations of infinite- dimensional port Hamiltonian systems obtained by spatial discretization preserving the Dirac structure and develop algorithms robust with respect to this reduction.